I never used to be into night creams since my skin is already on the oilier side, but it has become increasingly drier as of recent & once-a-day moisturizing isn't cutting it. So when I was sent the AVEENO Positively Radiant Intensive Night Cream to try out, I was actually excited when I usually would have scoffed at the idea. 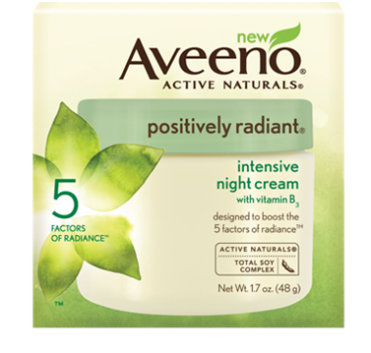 The AVEENO Positively Radiant line in general is great. I've used a handful of products & loved them all. This particular one is made with a total soy complex, which is supposed to help with discoloration of your skin. It's also oil-free, so people like me who have naturally oily skin don't have to worry about it being too heavy. I've been using it for about three weeks now, and I'm sold. I wouldn't say that it is changing the coloring of my skin drastically, but it is definitely making my skin brighter and more glowing. I use the LUSH Enzymion moisturizer in the morning, which is extremely lightweight and gives my skin sort of a matte finish, and then I use this at night, which seems to balance my morning moisturizer out. It's definitely thicker than my LUSH moisturizer, but it's certainly one of the lightest night creams I've ever tested. If you have pretty dry skin, I'm not sure that this would be thick enough to combat that. But for me, its absolutely perfect. It also smells amazing! This 1.7 oz jar retails for anywhere from $14.99 to $16.99, and there is a lot of product in it. A little goes a long way! It's sold at all the drugstores I've seen, as well as Target and Ulta. Let me know if you try this out and how it works for you, and I hope y'all are having a fabulous day! Product sent to me for review by Influenster & AVEENO. All opinions are my own.